When it comes to continuous improvement techniques, you have many options. There are a variety of approaches and tools designed to support your effort to effect positive change. But it can be difficult to decide which techniques will work best. In the case of PDSA and DMAIC, it can be extra confusing because they are quite similar. 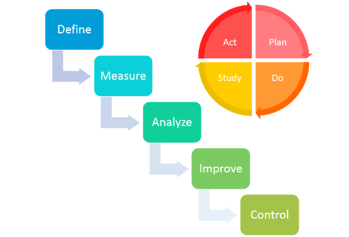 PDSA (Plan, Do, Study, Act) and DMAIC (Define, Measure, Analyze, Improve, Control) are both problem-solving approaches. In either case, the goal is to bring structure to improvement efforts and short-circuit the common habit of making changes without a thorough understanding of the root causes of issues. They are both also concerned with making sure that improvements stick. Organizations like the PDSA approach because it is ideal for incremental improvement. You may notice that PDSA is often depicted as a cycle. That’s because it is meant to be something that is applied over and over again. PDSA is never really done. (In fact, PDSA is also known as the Deming Wheel or the Deming Cycle.) It can be deployed quickly and is particularly effective for small to medium sized problems. It is a useful way to control trial and error type experimentation within the improvement framework. When PDSA is deployed, organizations can expect a series of quick “wins” that add up to significantly impact business results. DMAIC comes from the Six Sigma paradigm, so as you might expect, it places a heavy emphasis on data. Unlike PDSA, which places the “Do” step second, you don’t get to the action step (Improve) in DMAIC until four steps in. Because so much effort is put into the preparation part of the equation, DMAIC is perfect for improvement projects that come with big risks or will be expensive to implement. It is ideal for large or complex problems, especially those that require cross-functional collaboration. It is a go-to approach for high-reliability organizations. It is also used most often when there is a lot of data to drive decision making. DMAIC is normally depicted as a flow chart, indicating that it has a distinct beginning and end. 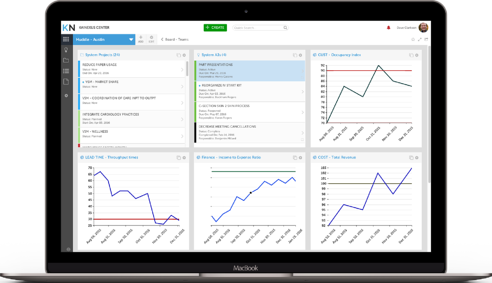 Because of the emphasis on data and analytics, the DMAIC approach can span a lengthy period of time. Asking which approach is best is a bit like asking if a hammer is better than a drill. It all depends on what you are trying to fix. PDSA and DMAIC each have a place and there is no reason that organizations can’t use both. Training your team on these and other improvement techniques is like adding tools to your toolbox. If you have a full tool box, you can think about each challenge and decide which one fits the situation at hand. Whichever you're using, continuous improvement software will help. Watch this free webinar to see it in action.